Eugene Christophe was born in Malakoff, near Paris on 22 January 1885. He was a professional cyclist from 1904 to 1926. In 1919 he became the first rider to wear the yellow jersey of the Tour de France. In all he rode the Tour 11 times, finishing 8 but never winning, however, he is more legendary than many who did, mostly due to persistent rotten luck, most notably for the events on Col du Tourmalet in 1913. He was nicknamed ‘Cri-cri’ and ‘Le vieux Gaulois’ (The old Gaul). Eugene was working as a locksmith when he rode his first race at the age of 18, by 19 he had turned professional. He would ride as a professional for 22 years. In 1906 he rode his first Tour de France, finishing in 9th place that year and again in his second Tour in 1909. He rode again in 1911, abandoning on stage 12. 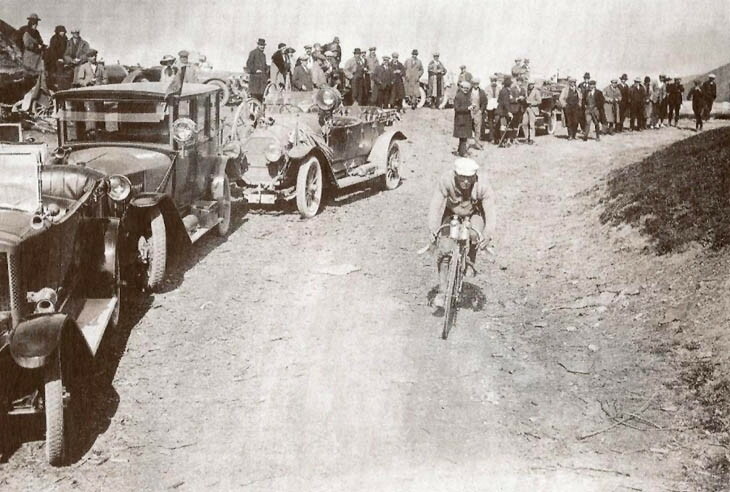 1912 was his best tour, he finished second and won 3 stages from solo breakaways, the longest break being 315km. The 1912 race was decided on points and not time, had it been time, Eugene Christophe would have won! For 1913 the Tour was to be decided on time and Eugene entered the race as one of the favorites. The route that year took the riders from Paris to Cherbourg and then down the west coast to Bayonne on the eve of the first mountain stage. Eugene had ridden a conservative race to that point, arriving in Bayonne in 2nd place on GC, 4 minutes and 5 seconds behind Odile Defraye of Belgium. The riders departed Bayonne at 3am for the 337km stage to Bagneres-de-Luchon across Col d’ Osquich, Col d’Aubisque, Col du Soulor, Col du Tourmalet, Col d’Aspin and Col de Peyresourde. Eugene and his Peugeot team set a hard pace right from the start and by Col d’Aubisque Defraye was over 10 minutes behind and by Argeles-Gazost 1 hour. In the Gorge du Luz Christophe attacked and rode onto the Col du Tourmalet on his own, with Philippe Thys of Belgiun following a few hundred metres behind. By the summit the gap was 18 minutes. Eugene made a quick stop to change round his flip-flop wheel and headed down the Tourmalet at full speed convinced that victory in the Tour de France was his. 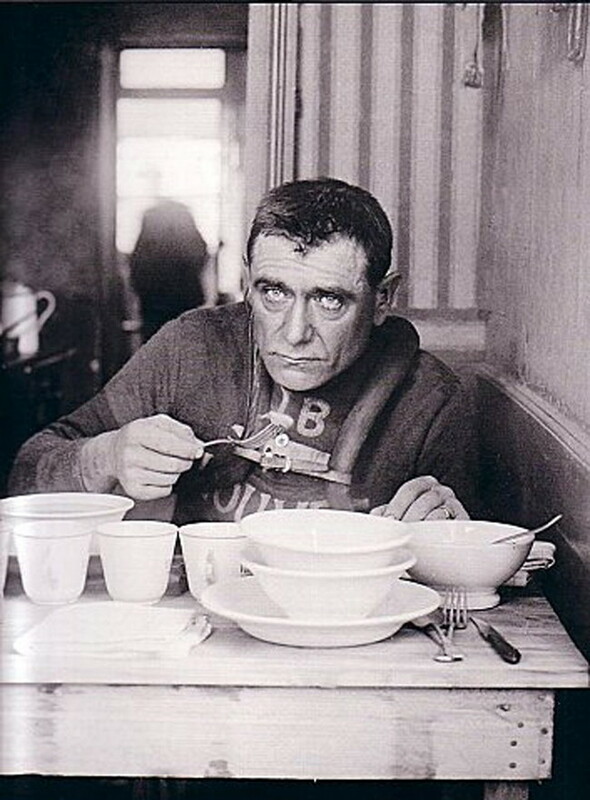 What happened next made Eugene Christophe a legend in his own lifetime. It has remained one of the most controversial and compelling stories in the history of cycling. For many years the story was that Eugene had been knocked off by a car which had broken his forks. 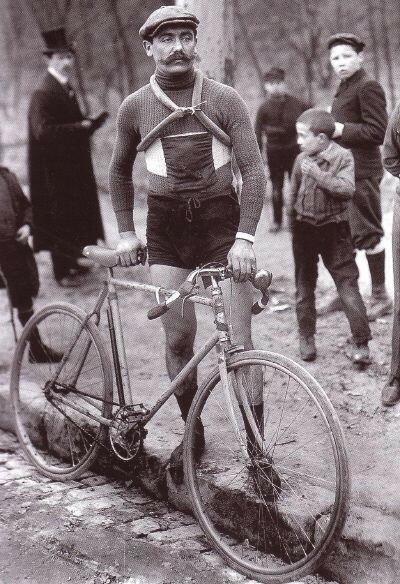 The rules were that a rider must complete the route unaided and so Eugene who was the French Cyclocross National Champion at the time, shouldered his bike and walked the 10km to Sainte-Marie-de-Campan. Eugene and his team were sponsored by Peugeot and rather than tell the truth about the bike they made up the story about the car. Eugene would reveal the real story years later. “I plunged full speed towards the valley. According to Henri Desgrange’s (Tour Director) calculation, I was then heading the general classification with a lead of 18 minutes. So, I was going full speed. All of a sudden, about ten kilometres from Ste-Marie-de-Campan down in the valley, I feel that something is wrong with my handlebars. I cannot steer my bike any more. I pull on my brakes and I stop. I see my forks are broken. Well, I tell you now that my forks were broken but I wouldn’t say it at the time because it was bad publicity for my sponsor. Eugene filled his pockets with bread and setoff on the remaining 60km to Luchon, he arrived 3 hours and 50 minutes behind Thys. He was then informed that he was to be penalised by a further 10 minutes as in the forge when he was being instructed by the blacksmith on fixing his forks, a 7 year old boy had blown the bellows for him. The Peugeot team appealed to Desgrange for leniency and reason, Desgrange reduced the penalty to 3 minutes. Philippe Thys went on to win the Tour de France that year in a time of 197 hours and 54 minutes for the 5287km. Of the 140 riders to start the race only 25 would finish, Eugene finished in 7th place. Peugeot took the forks. 30 years later they returned them to Eugene as a souvenir. In 1914 he finished the Tour de France in 11thplace, before like so many others he joined the army at the start of the Great War. Eugene served in a cycling battalion on the western front. In 1919 the Tour resumed after the war. There was a shortage of material and dye for jerseys, many of the teams wore the same grey coloured tops. On the 482km stage from Les Sables d’Olonne to Bayonne, a race official suggested to Henri Desgrange that the race leader could wear a different jersey so that officials and spectators could distinguish him from the rest of the field. Desgrange liked the idea, the Tour de France was owned and sponsored by the sports paper L’Auto which was printed on yellow paper, for the following stage a yellow jersey was procured for the race leader to wear. The race leader was Eugene Christophe. Eugene was not happy about having to wear the jersey as he said spectators were laughing at him and shouting that he looked like a canary. The second last stage was from Metz to Dunkirk with Eugene still in yellow with a 30 minute lead. It was on a section of cobbles that disaster struck again. Broken forks! This time it was 1km to the nearest forge, he fixed his forks again, presumably blowing the bellows himself. It cost him two and a half hours, the yellow jersey and the Tour de France. Such was the outpouring of sympathy for him that L’Auto organised a public subscription and he was paid the same amount as the winner, 13,310 francs. He finished in third on GC. 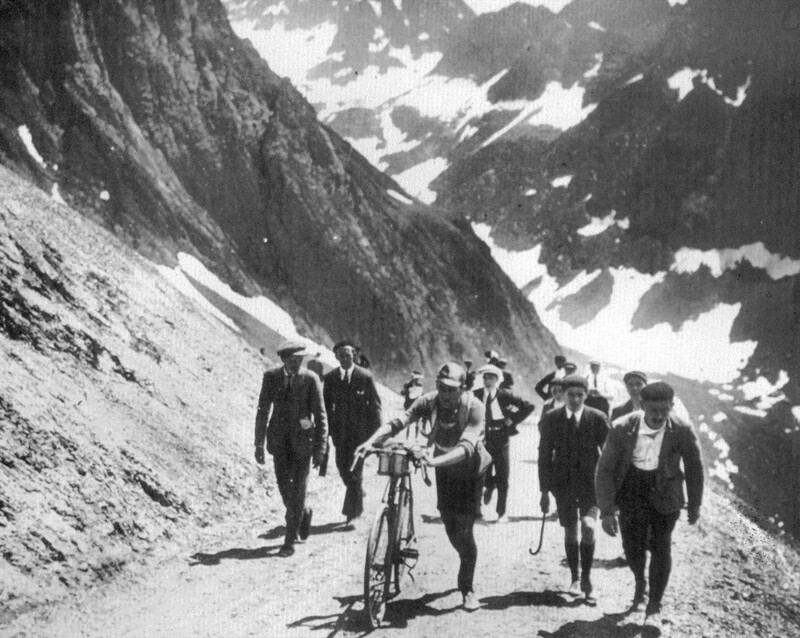 In 1922 placed in 3rd on GC on the descent of Galibier it happened again, this time when he walked to the nearest village he got the lend of a bike from a local priest to finish the stage. 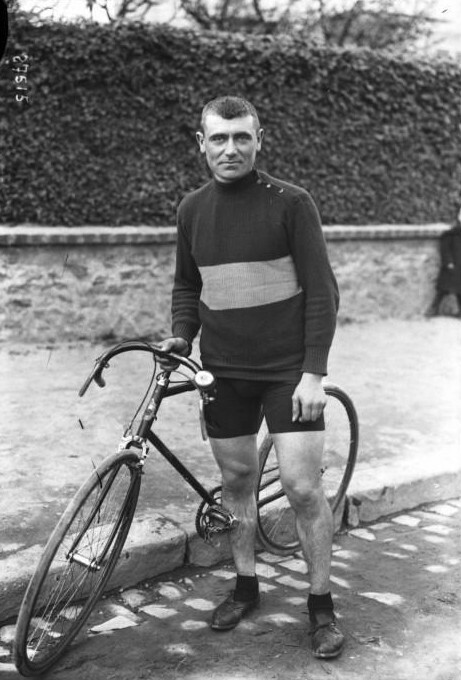 Christophe rode his last Tour in 1925 at the age of 40. His greatest victory as a pro was in 1910 when he won Milan –San Remo, of the 71 riders to start the race only 3 finished. Christophe spent a month in hospital after the race being treated for frost bite (think of that the next time you decide it’s too cold for a spin). Eugene Christophe was a member of L’Etoile Sportive de Malakoff cycling club from 1903 to his death on 1 February 1970 aged 81. In 1965 Jacques Anquetil gave him his Tour de France winner’s medal. 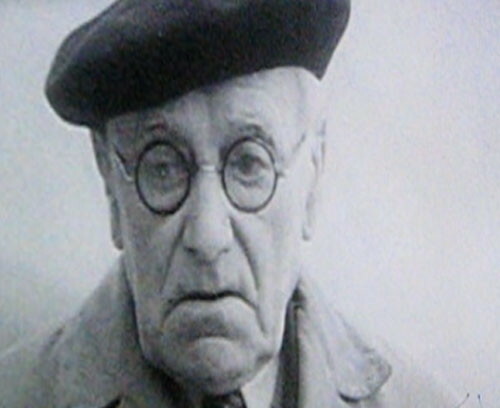 Eugene Christophe in old age. 1906 : 9 th overall. 1909 : 9 th overall. 1911 : Abandoned on stage 12. 1912 : 2 th overall and winner of three stages. 1913 : 7 th overall. 1920 : Abandoned on stage 7. 1921 : Abandoned on stage 8. 1922 : 8 th overall. 1925 : 18 th overall.